Dunnage Bag Inflator Gun, Dunnage bag inflator for quick filling of dunnage bags. 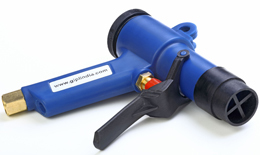 Type : Dunnage bag inflator gun for quick filling of dunnage bags. MOC : Tough Engineering Plastic, practically unbreakable. Inlet connection Size : 1/4" BSP Female thread. Additional feature : suspending hook and convinient levered trigger. Applications : dunnage bag inflator for quick filling of dunnage bags.